Lots of hard work by many fellow patients and caregivers. So proud of there effort and the articles they wrote. Special accolades to Betsy and Janet for organizing the whole effort. Please takes a look at a couple of great very practical articles, one by Dr. Byrd on ibrutinib, another byDr. Brown on idelalisib, and a lot more. Please let us know what you think of the newsletter as a whole or any particular articles. I would also like feedback on the work I did in the BASICS section on what is CLL with text and linked videos. We want the next one in December to be even better. Forward it to friends and send us your feedback. This week on the CLL Society website, we share an interview with my trial doctor, Dr. John Byrd out of Ohio State University, discussing how CLL drugs get to market and what the implications are for patients in terms of clinical trial design, especially in phase 1 trials for chronic lymphocytic leukemia. We met at the CRC (CLL Research Consortium) Scientific Meeting in San Diego in April 2015. The CLL Society also co-sponsored a patent forum the day before the science meeting began. There are several take-aways from my interview, however one that is critical is that we be well-informed, not just about the drugs we might be taking, but also of the details of the clinical trial design itself. Please take a look at cllsociety.org/2015/09/crc-... to see the interview and important related links. The CLL Society’s inaugural newsletter will be emailed out midweek and we are really excited about it: Dr. Byrd is has written a long Q+A on ibrutinib; Dr. Jennifer Brown gives practical advice on idelalisib; I cover the basics of just what is CLL/SLL and more in a monolog and transcription; plus several patients including WWW have written diverse and helpful articles. If you are interested, please sign up at cllsociety.org/newsletter-s... .
Another reason to sign up is that we will posting a backlog of great lectures and interviews and articles on CLL from CRC and my time at iwCLL over the next few months leading up to ASH and getting the alert is your best friend in knowing what new material we have posted. As always all our content is free and doesn’t demand any of of your information to be seen. Exciting times, but us patients still have to keep encouraging on the researchers. We aren’t to cure yet. We need to keep pushing. As always we provide all our content with no need to sign in, but I urge you to sign up for our alerts if you haven’t already here. By signing up, you will also receive our inaugural newsletter, the CLL Tribune later this month and you don’t want to miss this special collection of research news, basic CLL information, some cool surprises and fun facts. Many of the articles were written by our fellow patients and caregivers. I tripped walking into my medical office yesterday, scraping the front on my left knee just below the patella. I was tired, jet lagged having arrived home from Hobart, Australia less then 2 days earlier, was carrying a lot of stuff and was distracted talking on the phone with someone with CLL facing some tough choices. But I don't need any excuses. I fell because I have a bad knee. Actually two bad knees. Two very bad knees getting worse. Happily my knees are slow to react to trauma. I was able to hobble through a busy day of patients, but by the end of the day I knew I was in trouble. When I stress my knee (this is the second traumatic strain of my left knee in less than a month), there is no forgiveness, no flexibility, no resilience. There is only pain and swelling and loss of function. In this case despite the anterior trauma, the back of my knee swelled up with a huge but benign Baker's cyst, a synovial swelling that restricts my ability to fully extend my joint and thus to walk without pain and a forward leaning posture reminiscent of the elderly osteoporotic women I met in my travels to Japan. The good news is that it little hurts as long as I lie still with it raised, slightly flexed and packed in ice. Which is what I did today. All day. There is no definitive treatment for a Baker's cyst. The real treatment is to take care of the problem causing it, namely in my case, the end stage osteoarthritis of the knees. Blame street hockey or junior high football or my mother's arthritis. My joints spaces are so narrowed medially that I have lost height due to a varus or bowlegged deformity that makes me look as if I have rounding up cattle all my life. After a total of four surgeries, the only answer left on the (operating) table is to totally replace the knees. I have scheduled the surgery twice now and backed off both times. Why? Because if I vigorously exercise to stretch and strengthen my knees it partially ameliorates the pain. I am pretty good at that a home, but lousy when I am the road as I have been for 15 days in Australia. If I use my walking sticks and acetaminophen and ice as I just did in Australia for two weeks, I can muddle through and still accomplish many miles of painful but manageable walking. Until I fall or twist or the knees just give out on their own. And that's happening more these days. So why have I cancelled the surgery twice now? Due the increased bleeding risk with ibrutinib, by protocol I would have to be off my ibrutinib for one week before and three weeks after while I am on blood thinners post-op from my bilateral knee surgeries used to prevent blood clots. I have chosen to be part of the 15% or so brave or stupid patients that do both at once to get it over with and limit my time off my cancer therapy. Being off ibrutinib for more than 8 days almost triples (13% versus 31%) my risk of relapse. I'd be off for about a month. Here is the recent ASCO abstract that lays out the facts. Joint replacement surgery itself may be associated with an increased risk of blood cancers. Makes sense when they are shoving titanium and glues up your hollowed out bone marrow. Reading this article will give you pause before you let an arthropod take a saw to your bones. I am at higher risk for peri-operative complications due my CLL including infections, bleeding and clots. I have never lost a patient yet to osteoarthritis, but some patients who have relapsed from ibrutinib have had a poor prognosis. Here's the article from JAMA Oncology. Now if you dig into the studies that I am referencing, you learn quickly that the patients who went off ibrutinib for more that 8 days were generally much sicker and quite different than me and that whole study is being questioned, the total joint patients with subsequent blood cancer are still rare and a broad mix of surgeries, and the relapses post ibrutinib were clearly a different group than me. It is important when you review any research that you critically assess if you belong to the group being studied. Except for the study on joint replacements (and even that is questionable), I don't belong to any of the study groups. Still, as long as I can walk, I am staying away from the scalpel. And odds are that I will be walking much better by tomorrow. The ice and rest has helped a great deal. But there is another better option if time and circumstances allow. And they should. We all know that as good as ibrutinib is, it is not a cure. Trials of dual and triple therapies are already opening in response to this unmet need, but I would only qualify today if I fail my ibrutinib. I am pushing for trials that add in venetoclax (ABT-199) or a PD-1 inhibitor for that growing cohort of patients such as me who are doing well on ibrutinib or idelalasib, but who still have residual CLL. Don't wait for it to take off. Hit it while it's down by adding a second agent. In my case under the cover of a second anti-CLL drug that doesn't effect bleeding, I would then replace my damaged knees and have control over my two biggest health issues, my cancer and my arthritis. That's my plan and I am pushing hard to make it happen. These are good times for those of us with CLL and are options are getting better and better. UPDATE: Knee still swollen with limited flexion on day three. Walking is not happening despite a night of elevation and ice. 80% better by day 7. On a less personal note, the CLL Society was very busy in Australia with iwCLL 2015 being the only CLL group reporting from there, so stay tuned for some updates. Yours truly spoke in front of several hundred doctors on a panel with Dr. Michael Keating and other giants in CLL. Very humbling and very honored to have shared the patient's perspective in Sydney. I'll be in Brooklyn Oct. 3-4 for LRF's 20th Annual North American Educational Forum on Lymphoma and would love to say hello. Drop me an email and we can try to connect. The CLL Society's inaugural newsletter is coming out later this month. It promises to be amazing with some wonderful articles written by fellow patients and caregivers and with some great surprises. If you haven't already, please sign up for it here. We won't share your info with anyone and you will be sure to be aware of all the upcoming posting from iwCLL and ASH and much much more. The newsletter will be quite different from this blog or our CLL Society website, so please sign up here and don't miss it. You can't mail it in. You can't send your team. When you sit in the plenary sessions, when you hear the tough questions, when you grab the doctors and researchers between sessions to hear their unrehearsed take on the latest data, you get a raw glimpse of where things are going for those of us with CLL. And let me tell you, it's going in the right direction. I attend this meeting with a closet full of different hats: as a patient so I can learn what I need to know to stay alive, as a doctor for my patients with CLL, as an advocate to fight for patients' voices, as a reporter to bring you the latest news, as the medical director of a nonprofit forge new alliances, as an educator and moderator as a very successful groundbreaking CLL patient forum (the first ever held in conjunction with iwCLL) , as interviewee on the patient's perceptive for other news agencies, and as faculty giving a keynote lecture on how the cost of our meds effects us patients. Stay tuned for much news here and of course on the CLL Society website. This week on the CLL Society website, in our Conference coverage section, we share the second part of an interview from ASH 2014 with Dr. Jeff Sharman with a discussion of the life and death pressures on our B cells and how that relates to ABT-199. We also cover the latest research on idelalisib and rituximab, and what research in general is still needed. I'm heading off to the International Workshop on CLL in Sydney, Australia today and will be attending sessions and doing interviews while I'm there. I'll be posting new information upon my return. Stay tuned. We are also co-sponsoring a small patient meeting with Lymphoma Australia. Also, we will be sending out our inaugural newsletter, the CLL Tribune at the end of September. Don't miss this special collection of research news, basic CLL information, fun facts and a wealth of wisdom and shared experiences from our fellow patients. 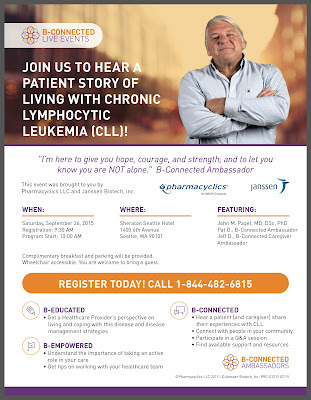 If you are receiving this information through a CLL Society Alert email, you are already signed up to receive it. If you are reading this through another source, sign up to receive it here. I am off to Sydney, Australia tomorrow with our nonprofit CLL Society where I will be your unpaid in person reporter from the meeting. I am also speaking at iwCLL 2015 on a panel with Dr. Michael Keating, Dr. Andrew Roberts, and others on the Funding Equation where we will discuss ways to improve access to our meds despite their expense. I am talking about the Canadian and American patient experience. And despite greatly discouraging logistical difficulties, we have also organized a patient Q+A session in conjunction with the wonderful team at Lymphoma Australia in Sydney for patients that are coming from as far away as New Zealand. We should have video from the doctors attending: Drs. Wierda, Wiestner, and Trotman. It’s a very very long trip, and much work, but I am excited about this amazing opportunity to go and to share what I learn firsthand with the gang here. Let me know if you have any burning questions for the gathered experts.